Documental sobre los coleccionistas de sonido, realizando grabaciones de campo con Juan Carlos Blancas. 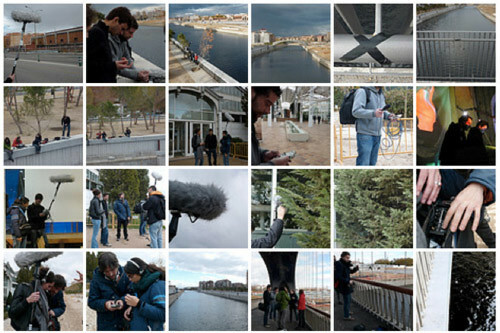 Metros cuadrados de sonido is a project initiated by the collective/netlabel AddSensor which proposes a collaborative sound mapping of Legazpi-Arganzuela, a neighborhood in the metropolitan area of Madrid. The project intends to generate awareness about the role of sound and listening in our everyday life, specially in urban contexts. It does so activating exploration and collaborative creative processes, firstly documenting the urban sounds and second, inviting to produce derived works which make use of the recordings posted in the online map of the project. All those materials are published under CC licenses. 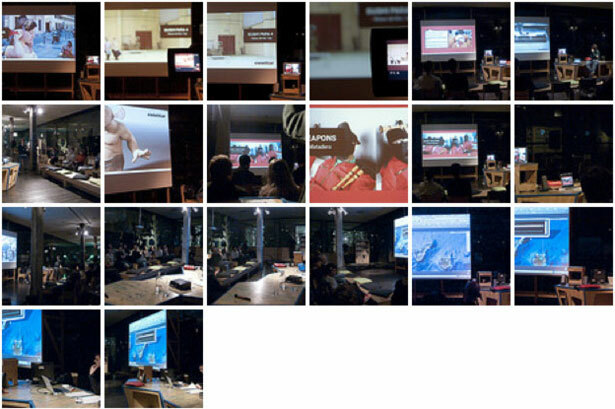 The activities of the project are hosted by Matadero Madrid and the initiative is supported by the contemporary creation program of Intermediae. 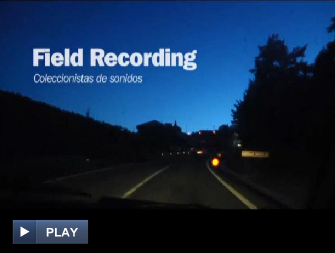 I have participated on this project imparting a two-day intensive introductory workshop to phonography and field recording, which was oriented to work as a trigger for the sound mapping process. We were surprised of the huge amount of people interested as we got suddendly almost forty applications (!!!). However, space and resources were limited, so it is a pity that a lot of people could not attend this time. The group was enthusiastic and rich in backgrounds: architecture, media, tv, radio, journalism, electronic music, philosophy, engineering, archaeology, literature… So we had all sorts of artists, tech people and scholars sharing interests and curiosity for sound and listening practices, which provided from the very first moment a positive atmosphere of creative exchanges and sharing. On the first day we discussed about our experiences and the importance of sound in everyday life, listened to a few artworks based on urban sounds and learned about audio technology and basic recording strategies. Day two was devoted to location work in the surroundings. We got self-organized in three teams which explored different places and at the end of the day we did some editing and listened back to a selection of the captured sounds. A weekend feels such a short time for an endeavour of this nature but anyway I think it was a productive time and (I hope) everybody went back home resonating with new ideas, inspiration, tips and for sure knowing a few new comrades. The online sound map has started to get populated with those very first recordings made during the workshop and hopefully it will grow up soon. I uploaded there (and to Aporee Maps) a few excerpts of my Sunday sonic explorations. They are also posted below. All the recordings were made with a Fostex FR-2 LE and a pair of DPA 4060. This workshop was a nice opportunity to meet interesting people and actually to reflect on my own practice and many of the issues behind it. Thanks to Iñigo, Andrea, Sila, Ana, Sergio, David, Daniel, Guillermo, Ana, Ángeles, Carmen, Carolina, Noèmie, Milos, Déborah, Sergio, to the AddSensor team (Ana, Miguel, Ángel and Tono) and the people working at Matadero for contributing to such a great experience. Now it is time for the project to continue developing with more recordings, people involved and forthcoming derived works and remixes. So far there are a few events already scheduled: a meeting and presentations on Dec 3 and a concert series in January, check the program for detailed info. View more presentations from 20020. Hemos subido las fotos del taller a una cuenta de flickr, donde subiremos todas las imágenes del proyecto, aqui os dejo con algunas del paseo que hicimos por el barrio buscando sonidos.